Fourknocks is a Passage Chamber Tomb built about 5000 years ago. 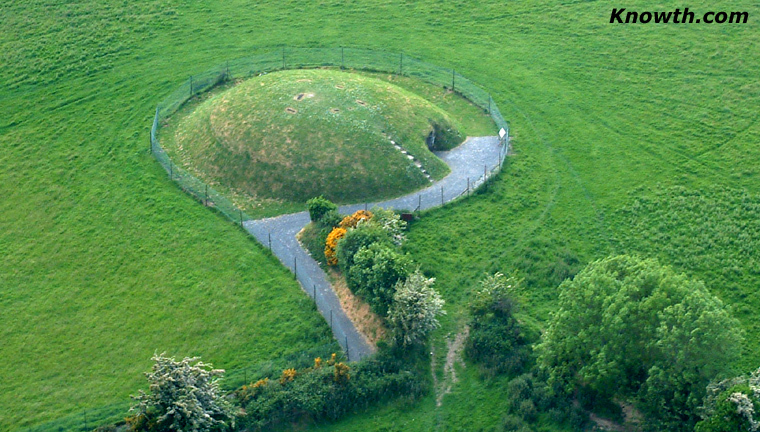 It is located 10 miles southeast of Newgrange between Ardcath in County Meath and the Naul in County Dublin. The name Fourknocks may be from the Irish Fuair Cnocs meaning Cold Hills or maybe Four Cnocs is a reference to the Four Tombs (Four Hills). Only the main tomb pictured above has been excavated and is open to the public. Fourknocks has a short passage leading into a wide pear shaped chamber with three smaller offset chambers. The original roof was probably a wooden structure supported by a central pole. The current concrete roof was constructed in 1952 at the end of a 2 year excavation. Fragments of 65 burials were found in the tomb, both cremated and unburnt remains of adults and children. Decorated Pottery and Vessels and personal ornaments including pendants and beads were also found. All of the items found were moved to the National Museum. 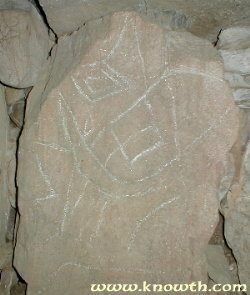 Just inside the main chamber to the left of the entrance is one of the few representations of a human face from the Neolithic Period in Ireland. The Face Stone is about 3 feet high and looks like a prehistoric smiley face. The key for the entrance door to Fourknocks Passage Tomb can be got from Mr. Fintan White who lives over a mile from the Tomb. Directions are signposted from Fourknocks. A cash deposit must be given which is refundable on the safe return of the key. The key should be returned before 6pm. Two more Passage Tombs in the next field are overgrown with grass and furze bushes. There is no public access to these Monuments from the main Tomb with a "No Through Access" sign to discourage visitors from climbing over the fence. Directions to Fourknocks including a roadmap of the local area. There are two unexcavated sites in a field next to the main mound which are overgrown with grass and furze bushes. There is no public access to the unexcavated sites with a "No Through Access" sign to discourage visitors from climbing over the fence which surrounds the main mound. Fourknocks in the Snow. A snow covered landscape in Ireland is unusual, some winters pass without a significant fall of snow. The images of a snow covered Fourknocks were taken on the 29th of December 2000. Fourknocks - An interpretation by Martin Dier. A very interesting article exploring the less obvious reasons why structures like the Fourknocks were sited where they were. Martin explores Archaeological Considerations, Astronomical Considerations, Engineering, Geomantic Aspects, Yin and Yang, Psychodelia and Sacred Geometry. Greenanstown Stones, located a couple of miles from Fourknocks. Entrance to Fourknocks with rays of afternoon November sunshine. 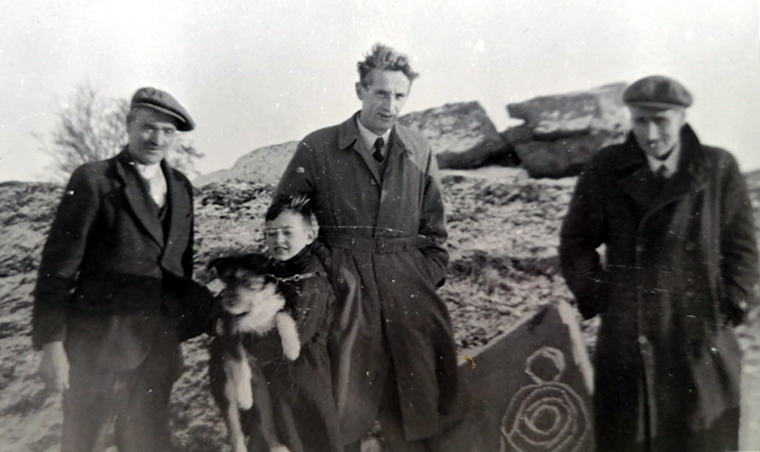 P J Hartnett at the excavation of Fourknocks, 1951.